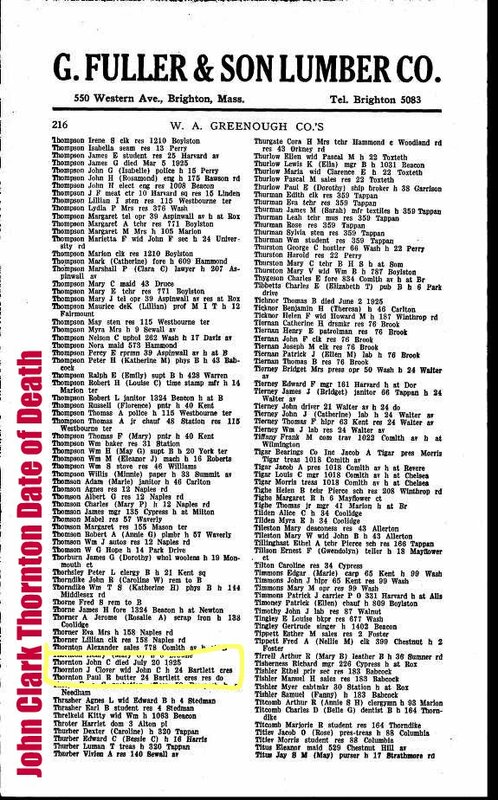 I have been looking for sometime for the date of death for my great grandfather John Clark Thornton. His death falls in that time before the Social Security Index and after the date which most states release vital records. I knew he died between the 1920 and 1930 census, but not the actual date. I called the cemetery where he was buried, they could look it up,if I could tell them the section and plot number where he was buried. I didn't want to pay for a copy of his death certificate either. So, I had given up on finding it. Yesterday I was chasing down one of his cousins, Mary Harris Thornton Copithorn. She was the daughter of his Uncle David Thornton and she and her husband had bounced between New Hampshire, Boston and Natick Massachusetts. I was looking for one of her children in the Brookline Directory, when I realized I had looked for John C. in the Boston Directory but not the Brookline one. Knowing that he was alive in 1920, I started checking the directory starting in 1921. This is the page from the 1926 Brookline Directory. So, there it is, his date of Death in a City Directory.